MTA Sophomore Sam Verstandig spent his winter vacation in Albany meeting with State Senators and Assembly members to discuss the opioid crisis. Sam made his first trip to Albany as an 8th Grader to lobby for anti-bullying legislation. Since then, he has made many return trips, accompanied by his parents, to push for legislation that he feels is important. On this trip, Sam met with Washington Heights Assembly member Carmen De La Rosa, Senator Robert Jackson, and Lieutenant Governor Kathy Hochul. He also attended a Senate session, which began with his father, Rabbi Stuart Verstandig (YC ’80, FGS ‘83, RIETS ’84), delivering an invocation reflecting on how the 10 Commandments of Leadership coincide with Parshas Yisro. 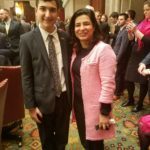 Sam had the honor of meeting newly-elected Senator Anna Kaplan (SCW ‘85 and CSL ‘90) on the Senate floor. Sam was also introduced on the Assembly floor by his local Kew Garden Hills Assemblyman Daniel Rosenthal. “I watched our government in action, as the hallways of the Capitol building were filled with lobbyists and protesters due to the signing of multiple bills by Governor Cuomo,” said Sam. “I hope to pursue a career in politics one day and appreciate the opportunity to continue learning about how our local New York State government works.” As Founder of MTA’s New York Political Action Club and an intern at Yeshiva University’s Office of Government Relations, Sam enhances MTA’s civic spirit curriculum by sharing his experiences with his fellow students.